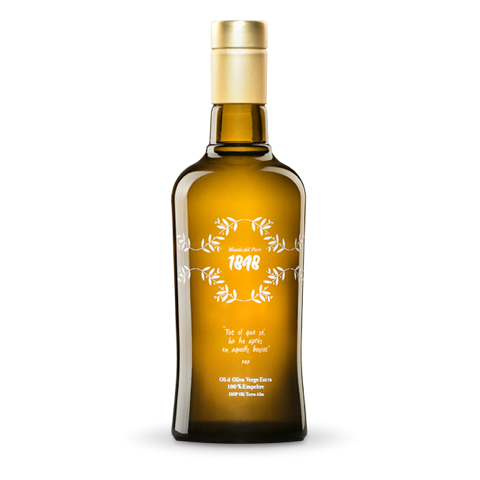 Massís del Port 1898 is the proposal of Agrícola Sant Josep to enjoy the ancient and healthy Mediterranean tradition of production and consumption of olive oil. We do it with a brand that celebrates and commemorates the days in 1898 when the Terra Alta landscape of Massís del Port mountains captivated, for the first time, one of the geniuses of universal painting of the 20th century, Pablo Ruiz Picasso. The significance of Massís del Port 1898 also refers to the importance of the olive tree in those years when it was the major crop in the entire region. The great freeze of 1956 damaged a great number of olive trees so it began to decrease the olive trees surface and started to increase the vineyard crop. But there are many trees that have survived history and in 2014, with a lot of enthusiasm, we started the project Massís del Port 1898. Our purpose was to distinguish our olive oil and also helping to keep alive the ancient olive trees in our region. Agrícola Sant Josep produces estate olive oil since 1962. We have always get the olive oil with physical processes and more than 75% of the olives are harvested directly from the tree, this is why we are allowed to classify most of the production in the top category of olive oil: extra virgin. We grow two varieties of olives: Empeltre and Arbequina. The first one, traditional mostly in Terra Alta and Bajo Aragón, is a rustic olive tree well adapted to our environment. 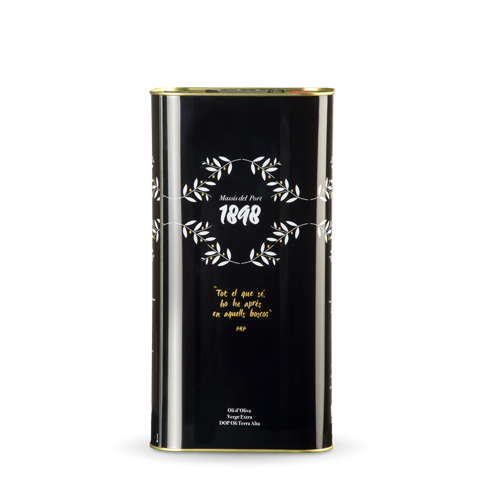 Massís del Port 1898 is a selected quality extra virgin olive oil. We get it mostly from the production of ancient Empeltre olive trees harvested between late October and early November. The grinding of the olives is done the same day they that are harvested and immediately arrived from the field, when olives are still cool. 100% of the production of this oil is qualified as PDO Terra Alta olive oil, PDO that covers the most characteristic olive oils of the territory since 2002. 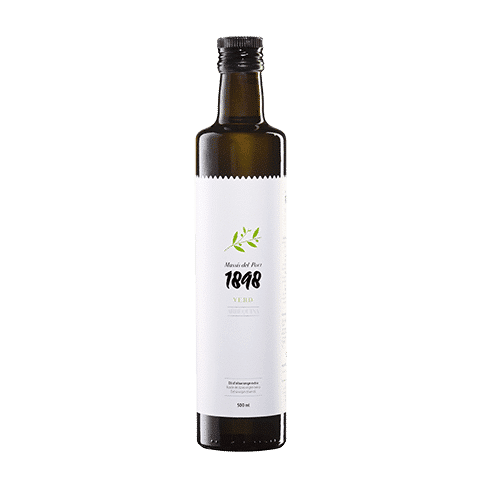 Massís del Port 1898 PDO Terra Alta olive oil offers two options to enjoy our extra virgin olive oil: 100% Empeltre bottling, ideal to enjoy this variety and to be consumed raw; and a large format, 5 litter can, specially designed for the kitchen. By choosing it you will help us to preserve the environment and landscape of our territory. 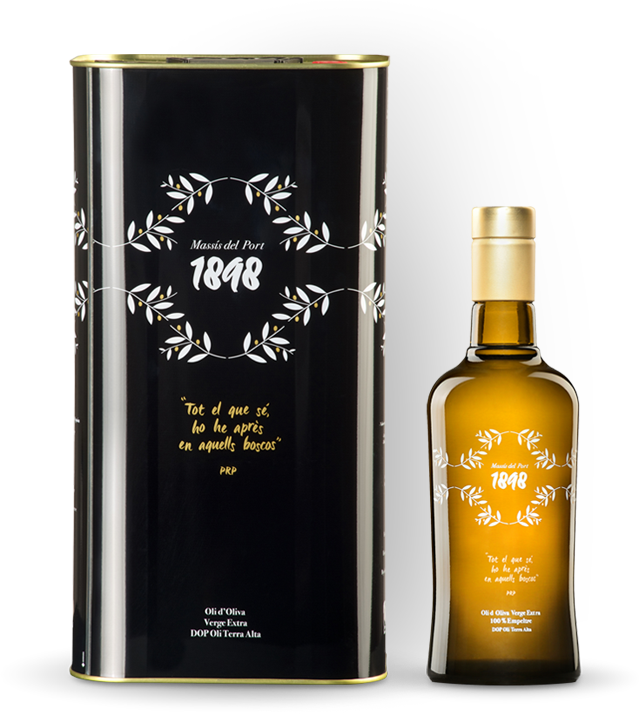 Massís del Port 1898 is the proposal of Agrícola Sant Josep to enjoy the ancient and healthy Mediterranean tradition of production and consumption of olive oil. We do it with a brand that celebrates and commemorates the days in 1898 when the Terra Alta landscape of Massís del Port mountains captivated, for the first time, one of the geniuses of universal painting of the 20th century, Pablo Ruiz Picasso. The significance of Massís del Port 1898 also refers to the importance of the olive tree in those years when it was the major crop in the entire region. The great freeze of 1956 damaged a great number of olive trees so it was began to decrease the olive trees surface and it started increase the vineyard. But there are many trees that have survived history and in 2014, with a lot of enthusiasm, we started the project Massís del Port 1898. Our purpose was to distinguish our olive oil and also helping to keep alive the ancient olive trees in our region. Agrícola Sant Josep produces estate olive oil since 1962. We have always get the olive oil with physical processes and more than 75% of the olives are harvested directly from the tree, this is why we are allowed to classify most of the production in the top category of olive oil: extra virgin. We grow two varieties of olives: Empeltre and Arbequina. The first one, traditional mostly in Terra Alta and Bajo Aragón, is a rustic olive tree well adapted to our environment. 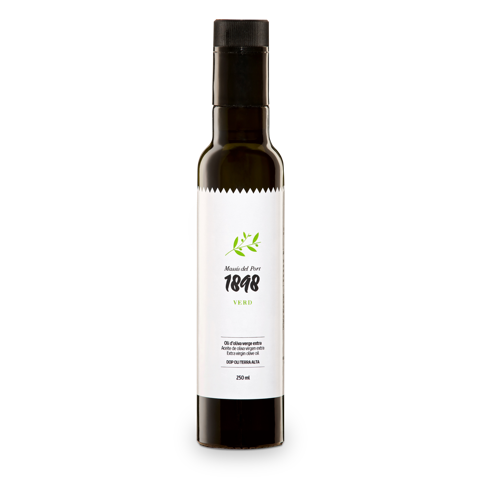 Massís del Port 1898 is a selected quality extra virgin olive oil. We get it mostly from the production of ancient Empeltre olive trees harvested between late October and early November. The grinding of the olives is done the same day they that are harvested and immediately arrived from the field, when olives still cool. 100% of the production of this oil is qualified as PDO Terra Alta olive oil, PDO that covers the most characteristic olive oils of the territory since 2002.